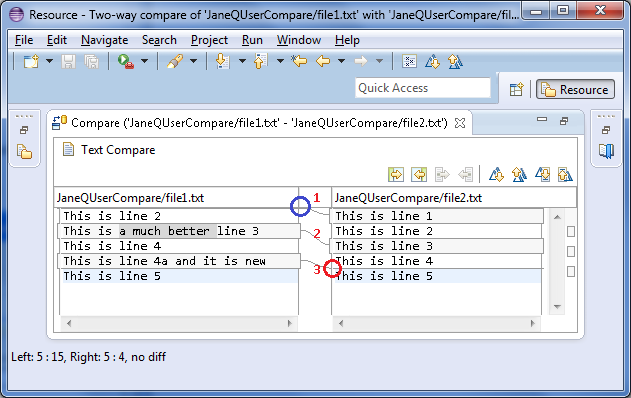 If you compare two files (file1.txt and file2.txt), the following results are shown in the compare editor. The left side shows the contents of file1.txt and the right side shows the contents of file2.txt. The lines connecting the left and right panes indicate the differences between the files. You can double click on the editor tab to maximize the editor. Starting with the top line (in the left pane) we can see that the difference bar (in the area of the blue circle) indicates something is missing from the very top of the left file. If we follow the difference band (see #1) to the right file we can see that it contains "This is line 1" . Moving onto the next line (colored in gray) we can see that the left file and right file have different contents for this line (see #2).Also, you can observe that a part of the line is highlighted. You can turn this option off on the General > Compare/Patch preference page. The next line ("This is line 4") is once again in white, so we can skip it, since the contents are the same in both. The next line exists in the left file but since it is gray we follow its difference bar to the right (see #3) and notice that the right file does not contain the line (see red circle). Hint: On the right-hand side of the comparison, to the right of the scrollbar, there is a column which shows a graphical representation of all differences between the resources. You can click on any of the segments displayed there to quickly scroll to that difference.